You may or may not remember, but back in 2011 the Meddlesome Moth put on The Avery Experience, a five-course dinner led by Adam Avery himself. Well, here we are four years later and it seems that the Moth's sister restaurant in Fort Worth is looking to do that event one better. 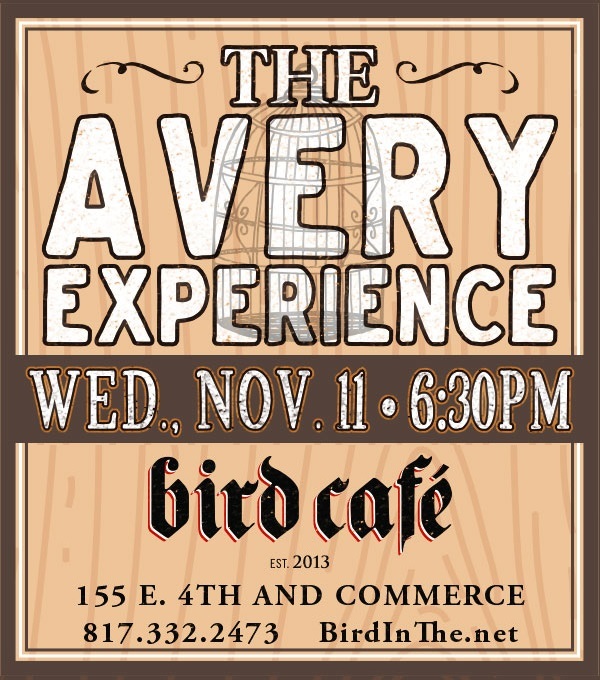 Coming up Wednesday, November 11 at 6:30 p.m., Bird Café will host a new incarnation of The Avery Experience, once again led by Avery, but this time with an even more impressive lineup of rare brews paired with courses crafted by Chef David McMillan. Cost is set at $85 per person, an amount which includes tax and gratuity. 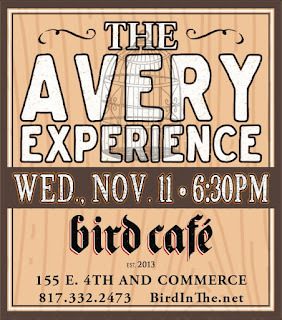 For more information or to make reservations, visit www.birdinthe.net or call 817-332-2471. Liliko'i Kepolo (Belgian witbier with passion fruit and spices added - 5.6% ABV). Insula Multos Collibus (sour ale aged in bourbon barrels with cherries added - 9.7% ABV). Roast antelope toast, fig preserves, Boursin and onion pickle on Boston brown bread. Fortuna (sour ale aged in tequila barrels with lime zest and salt added - 8.1% ABV). Hamachi crudo, yuzi ice, bourbon barrel soy, charred shishito and taro chips. Raspberry Sour (sour ale aged in oak barrels with raspberries added - 5.5% ABV). Savory latte de goat cheese, beet and raspberry panna cotta and Thai basil. The Beast (grand cru - 15% ABV). Whole roasted and carved smoked bacon slab, anadama pain perdue and warm "A" Vermont maple syrup. Pump[Ky]n (porter brewed with pumpkin and spices aged in bourbon barrels - 17.22% ABV). Malted pavlova, milk chocolate mousse, anglaise, pumpkin juice caramel and toasted pumpkin seed brittle and oil.